Have you every found yourself sitting there staring at the computer screen and knowing you want to share something on your social networks, but can’t for the life of you figure out what to share? (Actually, in reality, I generally find the opposite, where I am at the dinner table having family conversation and something comes up and I stop and say, “That is Tweetable!” The response is usually, “Don’t share that!”) Seriously, though, just today I found myself wondering what to share. Then, when I logged into Buffer, I saw something really cool! Suggestions! Ok, yes, I use Buffer, but I use it with other applications and don’t tend to log in directly, so this was a pleasant surprise. I’m going to give you a couple of ideas for freebie ways of getting social content to share and one that is very high quality, but has a bit of a price tag on it. So, everyone walks away with something they can use today and those of you who really need to get that content out there and have minimal time, may want to consider the paid option that will promote your brand in the way it needs to be promoted. 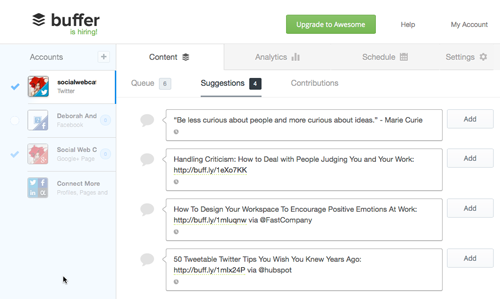 Not only is Buffer an effective way to schedule your social posts, but they also offer suggestions, like cool quotes and links to helpful content. If you click on the “Suggestions” tab in your buffer (shown in the image above), you will see some. And, as you notice by the image, it is available to freebie users, too. All you need to do is click on the “Add” button and the content is in your queue, ready to be sent out through the Buffer system. Now, that is cool, but you want a really long list of idea generators? Check out this blog post on Buffer’s blog. As a bonus, they talk about the content that they suggest. 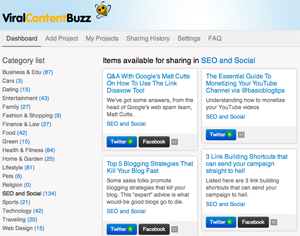 Viral Content Buzz is one of my favorite content marketing tools and one of the first I pull out for my own content marketing. However, it isn’t just for content marketing of your own material, but a great opportunity to *find* content when you are not sure what to share. There is a plethora of excellent articles to chose from, from high quality authors and experts in their field. I am not just recommending this because it was co-founded by fellow ninja, Ann Smarty, but also because it really is that good and indispensable. And, no, Ann did not ask me to say that! You can sign up for Viral Content Buzz for free and not only can you find content to share, getting you unblocked from your social sharing block, but you get “credits” when doing so and you are able to use those credits in exchange for getting your content shared. True, it isn’t free. But, if you are at a point where it is essential that you represent your brand in the most positive way possible, and you want to aim for becoming a household term, then you need to share social content that builds that brand. When it is no longer just a case where you have social sharing block, but you need to share relevant content that points back to your brand, then it is probably high time you consider bringing in specialists that can help you do just that. Then, you can focus on doing what you do and not worry about that writer’s block or social sharing block. Talk to a ninja about your needs and let us help you reach your objectives. Do you have something that works to get you un-blocked?